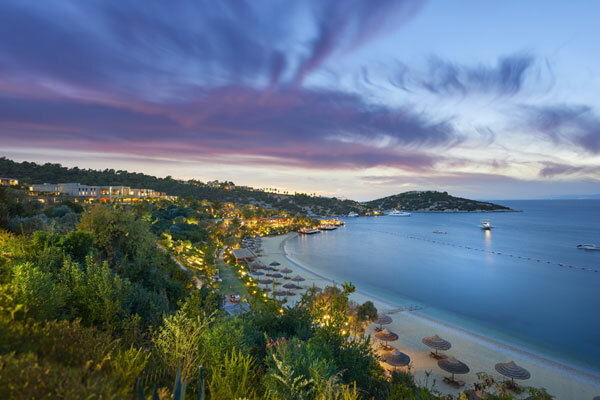 Mandarin Oriental, Bodrum in Turkey re-opens for the 2019 holiday season on April 1, with added luxuries on offer. Located on the shores of idyllic Paradise Bay, the five-star retreat has new accommodation, menus and other delights on offer this season. To celebrate, the resort has launched 'A Flavours of Bodrum' package that includes luxurious accommodation and fine dining. Brand new accommodation at the resort includes two villas and a suite located in its own private cove. The six-bedroom Arya Beach Villa and seven-bedroom Alisya Beach Villa will make excellent private party venues as well as tranquil getaways for families wanting to escape the crowds. Bookable together with the new two-bedroom Water Front Suite or separately, these suites overlook the picturesque cove’s Olive Garden Beach. Each has its own private swimming pool. Also new is the three-bedroom Blue Beach Villa, located at Blue Beach, and four-bedroom Olive Tree Villa, which is surrounded by an ancient olive grove. Winner of the Haute Grandeur Global Hotel Awards, Mandarin Oriental, Bodrum has nine restaurants and bars, offering a variety of cuisines. Executive chef Dario Abbate, an expert in Mediterranean cuisine, ensures guests enjoy sophisticated gourmet experiences at each resort restaurant. These include world-renowned contemporary Japanese restaurant Kurochan by Ioki, where a new menu will be presented to diners, and fish and seafood restaurant Bodrum Balıkçısı, which was awarded three pearls by the İncili Gastronomy Guide in Turkey. Chef Fabio De Paolis takes charge of the resort’s Italian restaurant Assaggio, winner of the Best Mediterranean and Italian Cuisine in Europe category at the 2018 Haute Grandeur Global Restaurant Awards, which opens for the new season on May 15. In addition to presenting an expanded menu, Assaggio will host entertaining workshops for guests on pizza preparation, local wine tasting and other valuable culinary crafts. Creative cocktail mixes and live music can be appreciated at Mandarin Bar, while The Mandarin Cake Shop invites guests to indulge in its artistically created exquisite desserts and cakes. At the resort’s private Blue Beach, where six additional cabanas will be added this season, guests can savour delicious snacks at its Blue Beach Club & Bar throughout the day. At the resort’s Pool Bar & Restaurant, poolside food and beverages will be served all day too. Outdoor activities at the resort ranging from scuba diving and snorkelling to sailing and fishing off Blue Beach. Sports facilities include two tennis courts and a basketball court, a jogging path along Paradise Bay, and multiple swimming pools. Winner of Best Spa Resort in Turkey at the 2018 Haute Grandeur Global Hotel Awards, The Spa at Mandarin Oriental, Bodrum offers Bodrum’s most extensive wellness and beauty treatments selection in a luxurious setting. Using olive oil, sage and lavender from the resort’s own gardens and other natural ingredients in its signature therapies, The Spa is also the perfect place for guests to try the age-old Turkish bath tradition at its authentic hammam. Crowned Best Destination Wedding Hotel at the 2018 Haute Grandeur Global Hotel Awards, the resort features a variety of venues for wedding-related events, such as the naturally glamorous Olive Garden Beach, with an expanse of grass, olive trees and stunning beach able to accommodate up to 400 guests. Combined, the beach’s Arya and Alisya Villas and Water Front Suite offer 15-bedroom accommodation, which can be used for hen parties, stag parties and other private gatherings, including traditional ‘henna night’ for brides on the eve of their wedding. For younger guests, Gymboree, a world leader in child development since 1976, offers educational and recreational activities through its Gymboree Play & Music programme that builds trust and promotes creativity in children. As befits Bodrum’s leading luxury resort, Mandarin Oriental, Bodrum offers private airport transfers, as well as helicopter and boat transport for guests arriving from other locations.